All about Tomorrowland Winter 2019: Where will it take place? how to buy tickets? How much does it cost? ¿When the festival will take place? Tomorrowland announced that the edition of this festival can be enjoyed during the month of March 2019 for 4 or 7 days. ¿How much does it cost to go to Tomorrowland Winter 2019? The price for the package of 4 days start at 685 euro per person and the package of 7 days start at 825 euro per person. ¿Where the event will take place? Alpe d’Huez is located only 1 hour away from Grenoble, 2 hours from Lyon and less than 5 hours from Paris. 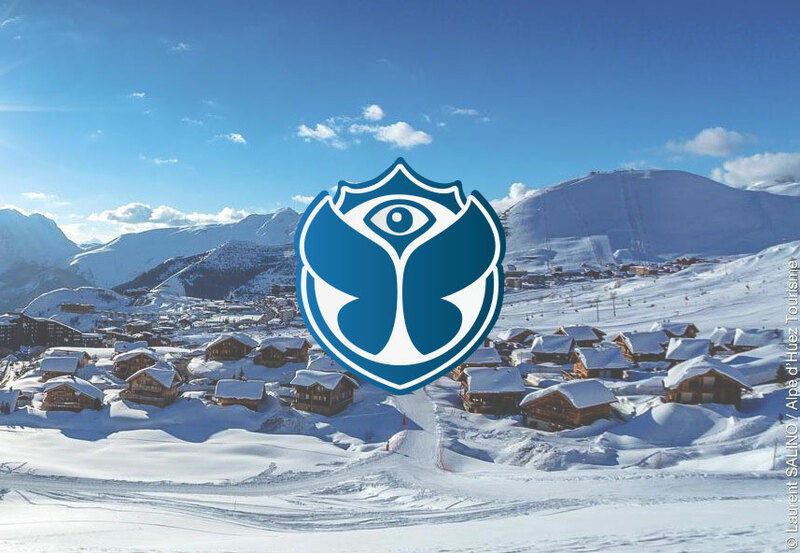 Specifically the event will be held in Alpe d'Huez Grand Domaine Ski, so it's understood that the festival will not only be a musical event, but an entire experience with winter activities. In this location, the entrance will be allowed and it will be reserved only-especially for people who have a Tomorrowland Winter ticket. ¿How much does it cost? Arrival on March 9 and departure on March 16. Access to the Tomorrowland festival areas in the mountain and the village from March 13 to March 15. Access to The Gathering - the Official Tomorrowland warming-up on Tuesday March 12. Access to all ski slopes and lifts from March 9 to March 16. On March 9, 10 and 11 extra activities will take place to welcome you to Alpe d’Huez and to make your stay as magical as possible. Arrival on March 12 and departure on March 16. Access to all ski slopes and lifts from March 12 to March 16. Every package includes a Tomorrowland Ticket, lodging and lift & ski pass. ¿When does ticket sale start? Packages for Tomorrowland Winter will go on sale September 8th 2018 (7 days package) and September 15th (4 days package). All information about packages will be available in the beginning of August. ¿How many tickets will go on sale? 30,000 people from all over the world will be able to witness the first edition of this magical event. ¿How to reach the event? Like Tomorrowland's summer edition, tickets for transportation to the festival, ski lessons, ski equipment rental and restaurants will be sold. This information will be made public at the beginning of August. We have so many questions about Tomorrowland and the answers to this questions aren't always on Tomorowland website or depends of our personal experience. This year will be my fifth and sixth Tomorrowland so I will help you with some answers you may need. 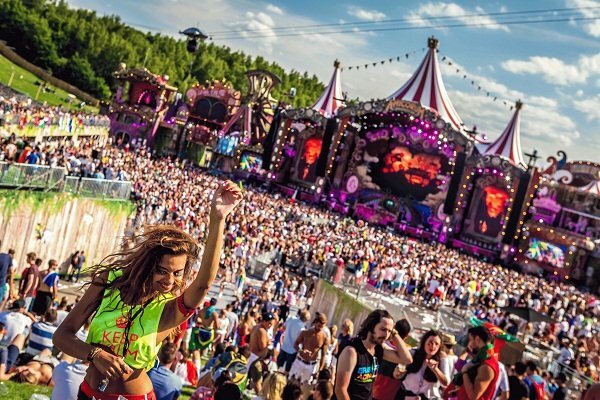 Which is the closest city to Tomorrowland? The next closest city is Brussels and it is the best option to spend the night before Gathering, since in Brussels there is more movement of bars and people who come from all over the world to go to the festival. What's the nearest airport to Tomorrowland? How to get to Tomorrowland on your own? 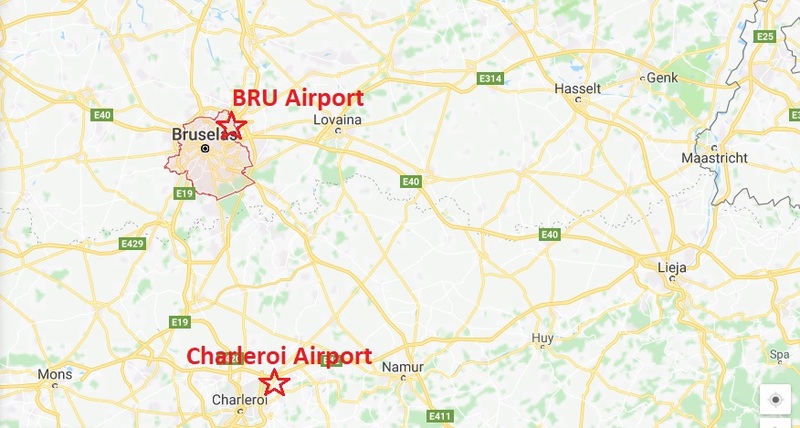 If you arrive by plane, you will land at the Brussels Airport. By train you will arrive at the Midi station. From the airport of Brussels there are official festival transfers that cost 25 euros and they leave you at the entrance of Dreamville. These transfers go on sale during the first week of June and you must choose a departure time. This option is the best if you want more flexibility and is not that complicated. You only have to take a train (they leave every 20 minutes) from the Midi station to the Antwerp station, then from Antwerp you take the train to Boom (in total about 8-10 euros). And outside Boom Station you'll see free buses that take you for free to the entrance of Dreamville. Can I use another person's credit card when making the purchase? Yes, there is no problem if for the payment method you use for intance the credit card of your mom, brother or friend. Can I be in another country when making the purchase and put a different shipping address? Yes. For example you can be on vacation in Italy but you reside in Spain. Without any problem you can buy your ticket while in Italy and only at the time of purchase you must place your country of residence in the shipping address. In global Journey No. In general sales Yes. However, currently many banks offer debit cards that "works like a credit card" these are usually affiliated with Visa or Mastercard, if you have that type of debit card you won't have any problem. Will I receive the "Treasure Case" if I take the Global Journey? Yes, you can choose to have it delivered to your home or pick it up at the airport / arrival station. Do all tickets include the "Treasure Case"? Yes, all tickets include one Treasure Case per person and they are shipping to your home address. What would happen if I have to travel time before they start to ship the Treasure Cases? Everything would be okay. 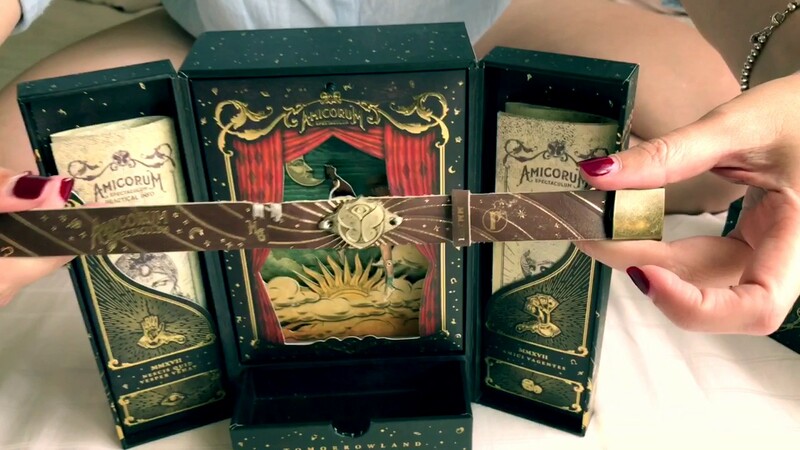 After you personalize your tickets (from February 5th to Feb 23th) Tomorrowland send you an e-ticket. In case you don't get the bracelets, these can not be activated (because they all have a unique code on the back) so that means that when you arrive at the festival you can claim a bracelet at the entrance showing the e-ticket + identity document. Then on Friday or Saturday you can claim the full treasure case if you are quick. Since 2015 every year I had friends who bought through Viagogo and so far none of them had any problems. If I buy from Viagogo they send me the bracelets to my home address? When you buy through Viagogo they send you an e-ticket one week before the event. With the e-ticket+ID you claim your bracelet at the Will Call point (festival entrance). After that, you are ready to enter the festival! You just have to put the bracelet on your right arm and pass it through the scanner where a green light will turn on and you will be inside. 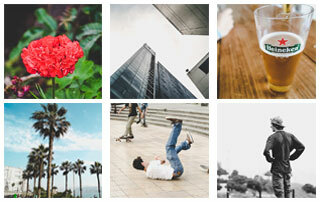 How does the personalization works? Is it true that Global Journey buyers doesn't need to personalize the tickets? The personalization is basically assigning the names of the attendees to the tickets that have been purchased. This is why those who bought Global Journey packages don't need to make the personalizaton, as they already placed the data of each assistant during the purchase. Every person who bought tickets through Top 20, Pre Sale and General Sale, MUST personalize the tickets. For 2018, the personalization period goes from February 5th to February 23th. Is is true that I can sell a ticket during the personalization period? Yes. If you have for some reason an extra tickets purchased through Worldwide Pre Sale and General Sale it can be sold as it's during the personalization process that you place the names of the attendees. In the same way you can buy the ticket for instance from A FRIEND and personalize it in your name. Of course, the bracelets will be send to the address of the person who made the purchase, and this can not be changed. Can I buy a ticket that has already been personalized in someone else' name? You can buy it, but I do not recommend it. At the entrance, although not everyone check the ID's, if they ask you and it doesn't match the data that was placed in the personalization they simply deny you the entry. Also, if your bracelet is lost or damaged, you won't be able to request another replacement because the data on your ID will not match the data placed in the personalization. Is it possible to cancel the tickets and get my money back? It's not possible. However, tickets can be sold before the end of the personalization period as I mentioned before, so you register the names of the new attendees. Can I attend the festival if I'm under 18? The festival is only for people over 18 years old or 17 years old if the same year of the festival you turn 18. How do I protect my valuables in Dreamville? All types of accommodation in Dreamville have lockers to store documents, cameras, etc. and there are various sizes. They start selling them at the end of May-June or you can buy them right there, they never sell out. 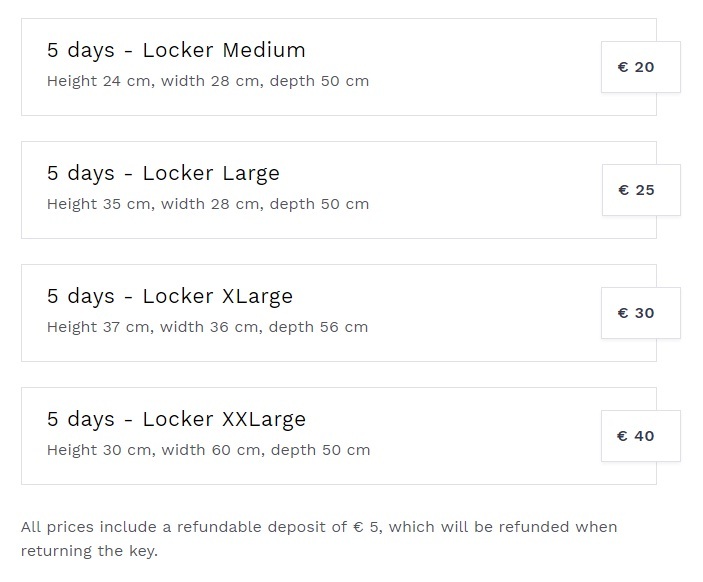 Which are the Locker's size? If I arrive on Friday, can I still enter to Dreamville? Yes, you can enter Dreamville until Saturday at noon. Once you check in at Dreamville you can leave and re-enter as many times as you want. Accommodations from Spectacular Easy tent to Cabanas, they all have an electrical connection. For Magnificent Greens and the festival where you spend more than 10 hours. There are very small portable chargers that support about 3 charges on average. Once they run out off energy you go to any recharging point and they give you a new one full loaded and you can do that as many times as you want. It's worth 16 pearls and they give you back 10 pearls when returning the charger for the last time. Can I enter with alcohol bottles or food? You can enter Dreamville with food and drinks The only condition is that drinks must be in plastic bottles and not glass. Cans of beer is allowed. To the Festival Area it's forbidden to access with some type of food or liquids. Can I enter with Reflex/DSRL cameras? You can access Dreamville area with cameras if they aren't very 'eye-catching', however, you can only access the festival area with this type of camera with a press pass. The cameras allowed are any action camera (like the GoPro) and any compact camera that doesn't have interchangeable lenses. Do I have to be prepared for the rain? YES, YOU HAVE TO. It's a reality that in Belgium, summer means sun and rain. So if you are prepared you won't have a bad time at all and not being able to do so may mean you don't have a good time. So you should consider having a water-proof tent or ziploc bag for your mobile phone. Something very good about the organization is that every time it rains the festival gives free ponchos for the attendees. The paid showers are basically the same throughout the festival, they have warm water and a door. The lines for the showers are usually from 10 am to 12. If you go earlier you won't find lines. If you stay in Easy Tent the lines are much smaller and in Dreamlodge, Relax Room, Cabanas there are never lines. Is it true Official Merch runs out very fast? Yes. If you want to buy merchandising from the festival store, you must do it on the first day because by Sunday almost everything is sold out. Is there Wi-Fi connection at the campsite or at the festival grounds? 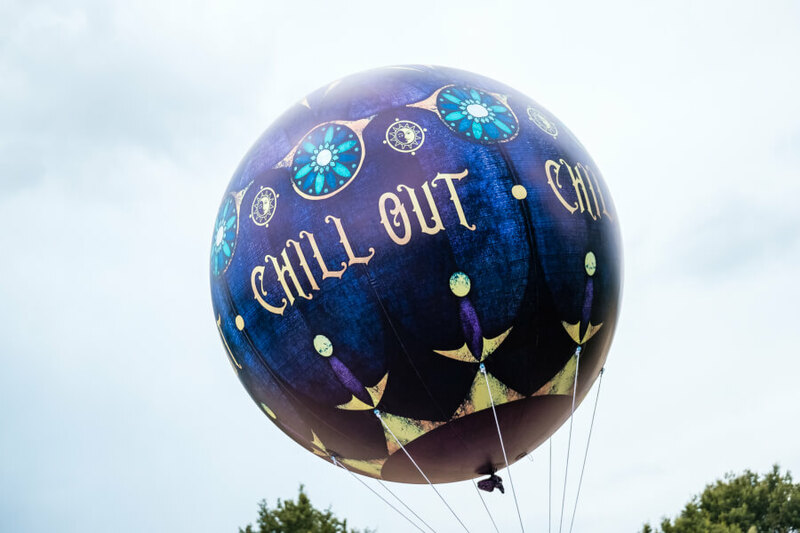 There are a couple of points with free Wi-Fi (Chill Out Zone Dreamville for example) but for the same reason that is free it could be saturated or a very bad connection. This is why I would recommend you to use your own internet service. Remember that roaming has been suppressed in the European Union, so if, for example, you have a chip from Spain, you can use it without problems in other countries of the U.E. When Restaurants, lockers and parking go on sale? Every year this tickets go on sale during the last week of May or first week of June. Last year they went on sale May 31th. How can I get ice at the festival? It¡s not that simple, but you can get ice. Your first choice is Dreamville supermarket (Lindt). They sell ice but it runs out very fast, so if you want ice you must go and buy it very early. The second option is to leave Dreamville by the rainbow that connects Magnificent Greens with the areas of Easy Tent and from this point walk on that street to the left (seeing the rainbow). You'll find a Carrefour about 10 minutes away or some neighbors sometimes also sell ice. If you think this has been helpful, share the post with your friends! The first step is the pre registration; second, the purchase; then personalization of the tickets and finally activation of the bracelets. ¿Can I buy Tomorrowland Tickets to another person? ¿Did you know that for Easy Tent, DreamLodge, Cabana and Relax Room you only register the name of 1 person? How is each step performed and on what dates? During this period all those who plan to buy tickets must pre-register and create an account. It's a mandatory step. Once you pre-register, they send you a link to your email. 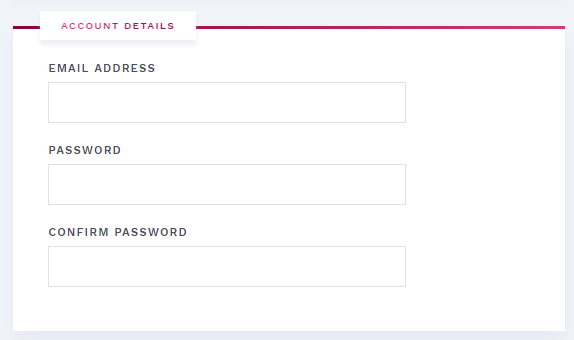 This email allows you to activate the account and access a platform that allows you to buy tickets, restaurants, etc. The first 20 people of each country who register, will have the possibility to buy 4 Tomorrowland tickets through a dedicated ticket link, before the Worldwide Ticket Sale. During this step a single person can buy up to 4 tickets (which then must be personalized with the names of the attendees in step #3). For top 20 the data entered at the time of purchase must match the data of the pre-registration, otherwise it's considered fraud. 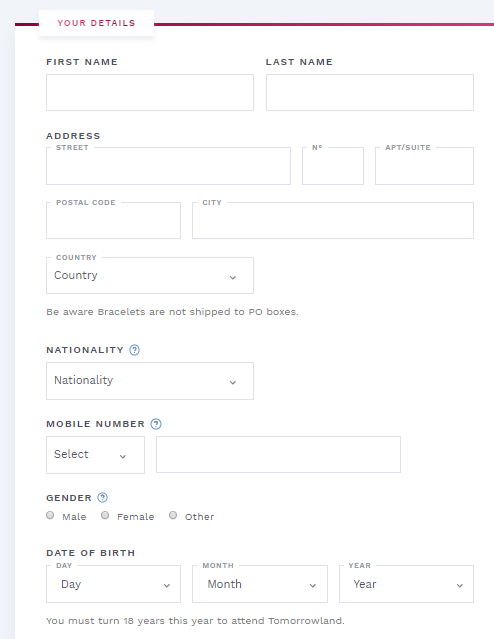 For example, if in the pre-registration you stated that you live in Costa Rica (to have a chance to get top 20) and when you buy the tickets you place the shipping address of the bracelets in the United States (because you actually live there), it's considered fraud. You will receive an email from Paylogic with a link to personalize your tickets. In this part of the process should be placed the data of the festival attendees and these must match their identity documents. Once placed the data of the assistants these can not be changed so it's not possible to resell the tickets. 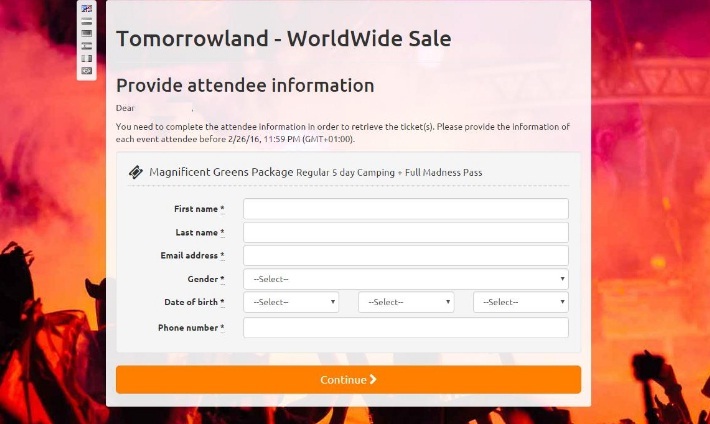 Tomorrowland will send some pdf tickets with the names of the registered attendees. (This so that in case the bracelets do not arrive on time to the delivery address, you can claim the bracelet at the door of the festival (will call) by showing the e-ticket + identity document). * If the tickets are Magnificent Greens, the personal information of each of the attendees must be placed on the form. At this point they send all the tickets (the bracelets) to the address of the person who made the purchase. Each bracelet has a unique code on the back. This code allows the activation of the bracelet. 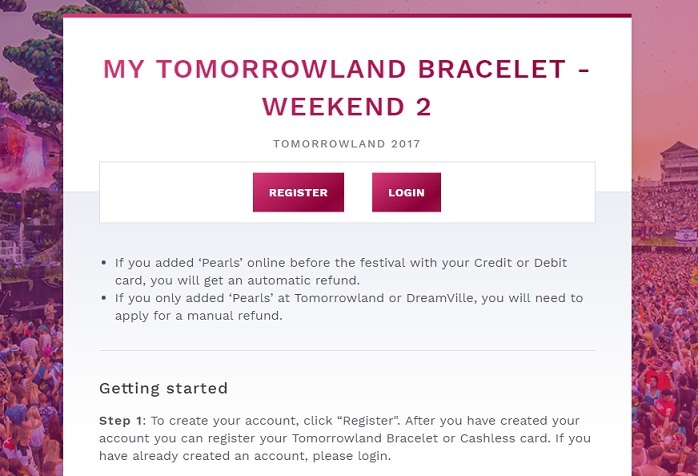 Each attendee must create an account with their personal data (Tomorrowland will provide the link) and once the account is created each person activates his own bracelet by placing the code that is on the back of the bracelet. Once this is done, the bracelet is officially unique and non-transferable and can only be used by the person who activated it. The person is ready to enter the festival and recharge pearls. *If the bracelet is not activated, it means that the tickets never arrived at the buyer's address and the buyer can claim the bracelets at the door of the event (will call point) showing the e-ticket with his name and identity document. What happens if I travel before the delivery period and the bracelet does not arrive at my house? No problem. When you personalized the tickets in step # 3, the data of the attendees are placed and these are shown on the e-ticket. With this e-ticket + ID you can claim a bracelet at the door of the event. Then, using your mobile phone to enter the website, you must activate the bracelet with the code that has on the back and you're ready to enter the event. Can I buy a ticket that has already been personalized in someone else's name?? You can buy it, but I don't recommend it. Since at the entrance, although not everyone check the ID, if they ask you and it does not match the data that was placed in the personalization, they simply deny you the entry. Also, if your bracelet is lost or damaged, you will not be able to request another replacement because the data on your identity document will not correspond to the data recorded in the personalization. The best way is buying a ticket not personalized yet to a friend and then personalize it with your personal information. Later they can give you the bracelets personally or give youthe bracelet code in advance so you can activate it on the website. With that being done you will not have any problem in any situation, since with your identity document you can request a bracelet replacement and you are the only owner.